While his peers like Lords Errol and Delamere were involved in intricate love webs, Egerton remained obsessed with one woman even after she refused him. Where Grogan made a ridiculous three year cross-continental journey for love, Egerton set to build her something she couldn’t refuse. Enchanted by the unnamed Austrian lady during a vacation in England, Egerton set out to convince her to marry him and move to Kenya. He invited her to his home at the time, a thatch-roof six-bedroom. She dismissed the house as being as small as a chicken coop or according to some anecdotes “…as a plane.” He was dismayed, if not heart broken. But he misunderstood her refusal, thinking she only refused him because he had a small house. So he decided to go majestic, enormously so. 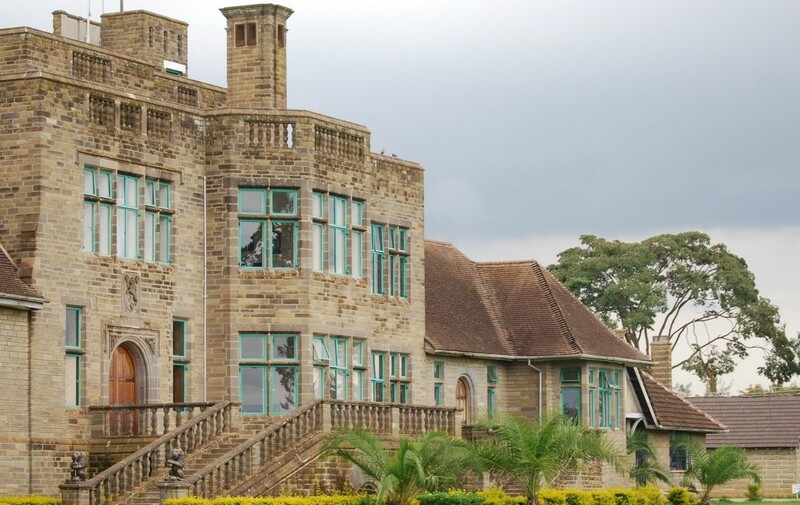 Lord Egerton envisioned a castle so elaborate and marvelous that there was no way she would refuse him again. That dismissal inspired the Baron to build 53-roomed castle that is so elaborate that his all-male retinue of 16 servants had to number the rooms to avoid getting lost within. Some anecdotes claim that The Egerton Castle was not built to impress the Austrian woman but as a monument to his solitude. The four-storied edifice is a symbol of wealth and extravagance, and has features such as an escalator that are still uncommon in private homes today. The zinc tiles on the roof, the dressed stones, the oak for the oak paneling, and the interior dcor were all shipped from Europe. Albert Baron, the engineer, was from Rome and over 100 of the builders brought in from Asia and Europe. Guests from as far as Zimbabwe and Malawi, then Rhodesia and Nyasaland respectively, attended the housewarming party. But the woman for whom it was built still said no.When she saw the castle, she dismissed it as a monument to vanity and a museum and drove out in a huff only two hours after arriving. She returned to England and fell in love with someone else. A big castle is, apparently, not the way to a girl’s heart. Lord Egerton became a delusional recluse and a passionate misogynist. He ran the castle as if he had the family he had envisioned. He had notices specifically banning females from visiting the castle pinned on trees and the gates. The notices threatened that any female trespassers would be shot on sight. The estate was closed to everyone except a small group of friends, doctors, servants, and overseas bands he invited over to entertain him. All the visitors had to leave their female companions at least eight miles from the castle. Even his staff would receive a two-week notice to vacate all women and girls from their living quarters whenever he planned a visit. He?also banned them from ever keeping chicken and dogs because his unnamed love interest had dismissed the first house as being as small as a chicken coop or a dog’s kennel. To while away time, Egerton threw all his energies and his entire fortune into agriculture. He founded the Egerton Agricultural College, now part of Egerton University and left his entire fortune to the government. Before his seemingly cursed pursuit, Egerton had been a pioneer aviator, an avid traveler, farmer, and an amateur filmmaker. Today, the castle is safe for anyone to explore. It is a favorite spot for photo shoots; a situational irony as women now throng where they would have run the risk of being shot only less than six decades ago. First published on the Daily Nation.